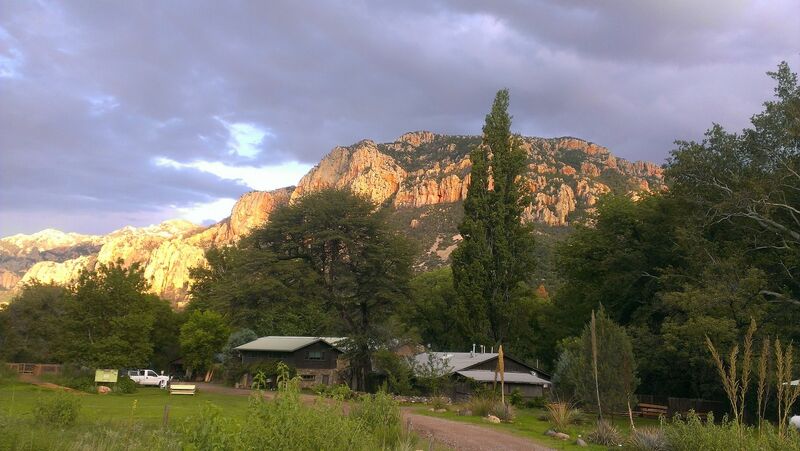 Ants of the Southwest is now accepting applications for their 10 day course over the summer of 2016! I attended this course in 2013 and had a blast. It's all the fun parts of the anting hobby in the most biologically diverse part of the US! 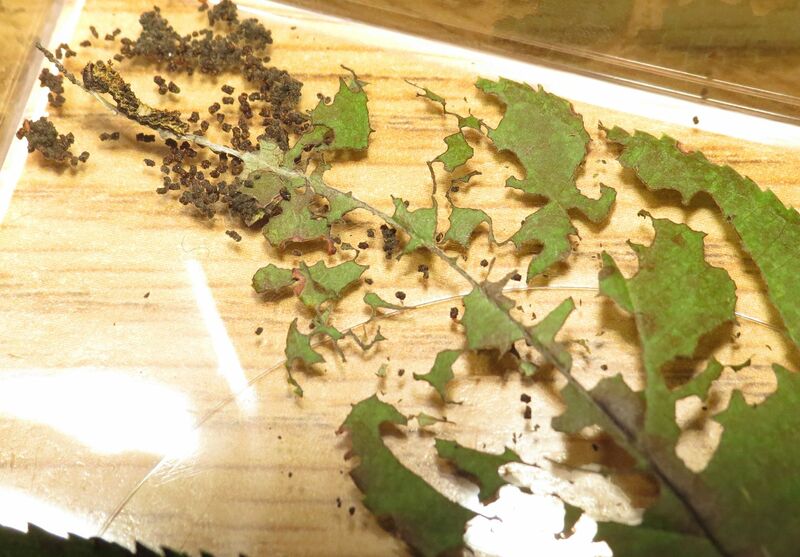 Pheidole rhea (Big-headed ants with super majors), Trachymyrmex (leaf cutter ants), Neivamyrmex (army ants), Crematogaster smithi, Acropyga, Odontomachus (Trap-jaw ants), Myrmecocystus (Honey-pot ants), and Cerapachys to name a few of the awesome ants I got to see that year. 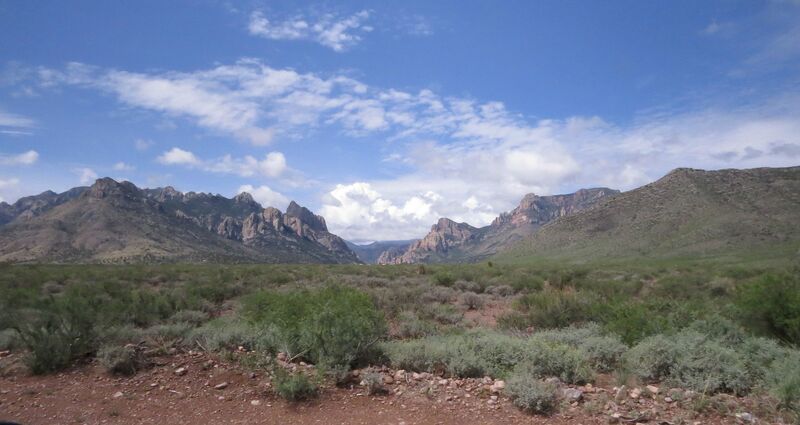 The Southwestern Research Station does "Science Tourism" very well. I wish more places existed like it in the world. First off you're in the middle of nowhere but also you're not roughing it that bad. The only two issues I really had with the place are as follows. One, it's a little hard to find. 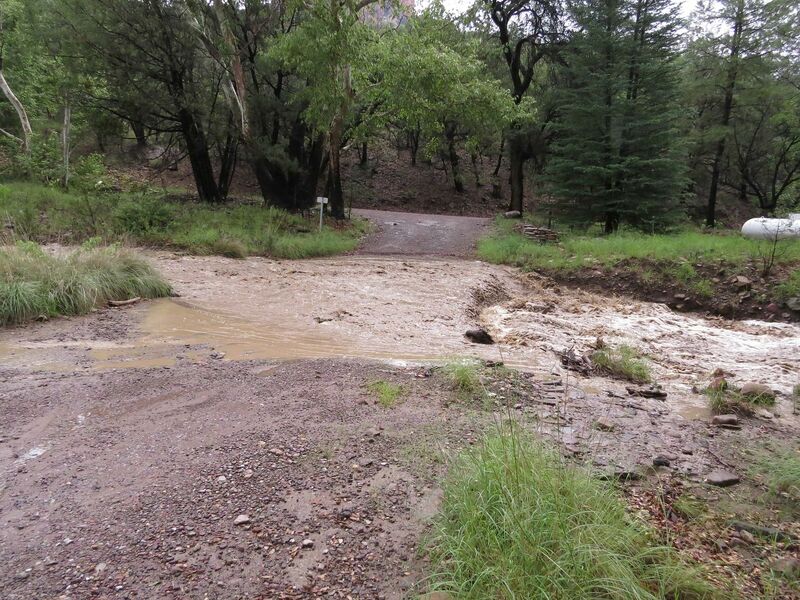 This wouldn't usually be an issue but it's in a place where the "roads" are just graded dirt and rain can wash boulders onto the path pretty easily and it's never comfortable fording a small river in a rental car (and not recommended!). Also a wrong turn can put you a half hour in the wrong direction, even though your GPS says it's a five minute drive... the "roads" around the place are that bad. Drive there during the day time! And Two, you need to bring your own supply of drinking water. They sell it at a shop in the station but it's only open 4 days of the week. There's another shop at a road stop down the road from the station but it's not always well stocked with so many folks using it as a resource. Beyond that, you'll likely be staying in a very reasonably sized dorm. You have access to full showers. The meals are great and a salad and dessert is almost always available if you don't like what they're serving. The place has an in ground pool on site. The view from your room and looking around in general is often fantastic to behold. Because they're part way up in the mountain the average temp is only in the high 70's (at least from when I was there.) For being in the middle of nowhere you could do a lot worse! When I went two years ago I was shocked at how few students there were. I think in total there were 11 of us, 3 of whom were instructors. I gathered that there would have been more instructors had there been more students. But as it was, there were only 8 and 3 of those were hobbyists. Take a moment to compare that to Ant Course which has a four year waiting list to get in and focuses more on the lab work side if studying and identifying ants. 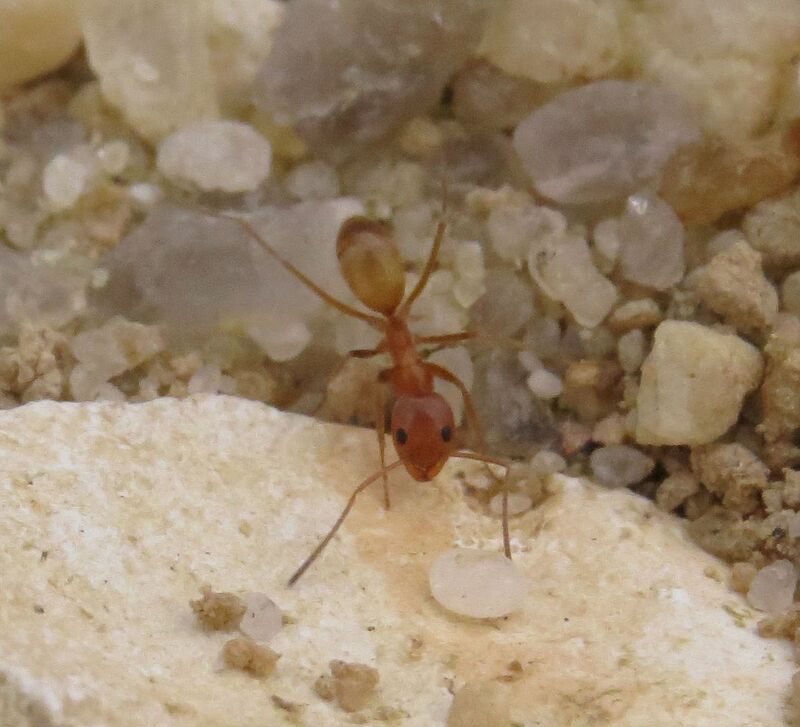 Ants of the Southwest is all the fun parts of the hobby; field work, specimen gathering, pinning ants, collecting data, I don't understand why Ants of the Southwest is the less popular of the two. If anything I found it a lot easier to get accepted into as a hobbyist. In total that's about $2,150 which sounds like a lot. But it's really easy to budget that. Get a credit card that has 0% APR for the first year or so. Even if it's one of the ones that charges you 25% interest you don't get charged that until the term is up. So every week you can just put $100 or so towards paying it off and you're good. At that rate it will take you 5 to 6 months and you can then apply for a better card that has a better interest rate. Another great reason to go is you never know what you'll find. 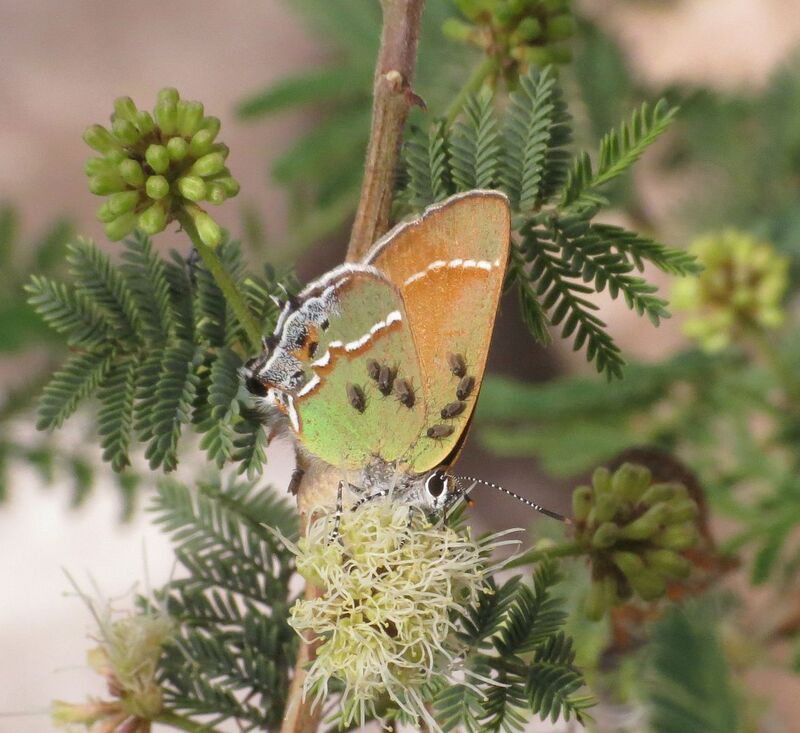 At the time that I took this photograph I thought it was just a butterfly with black spots on the wings. 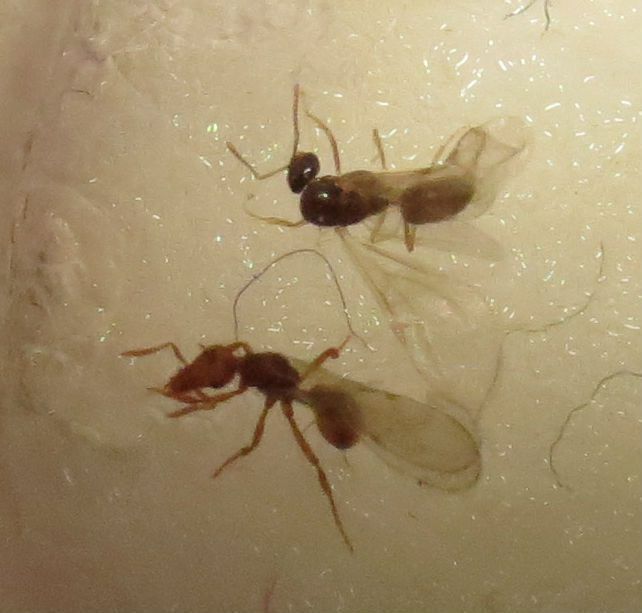 As it turns out they're actually midges, which are small parasitic flies that feed on the blood or haemolymph of animals or insects. They're considered one of the "no-sees" of the insect world. Meaning they're absurdly abundant but really you don't ever notice them unless they're already attached to something else. There are thousands of different species, many of which look identical, but mostly specialize on one or two groups of hosts. In this particular case, I believe I'm the first person to ever photograph them feeding on a butterflies wings, and not just one or two but at least 8 all at once following the vanes in the wings! So there are plenty of reasons to go to this course, and I say if the grad students aren't going to fill those places, then let the hobbyists fill it up! 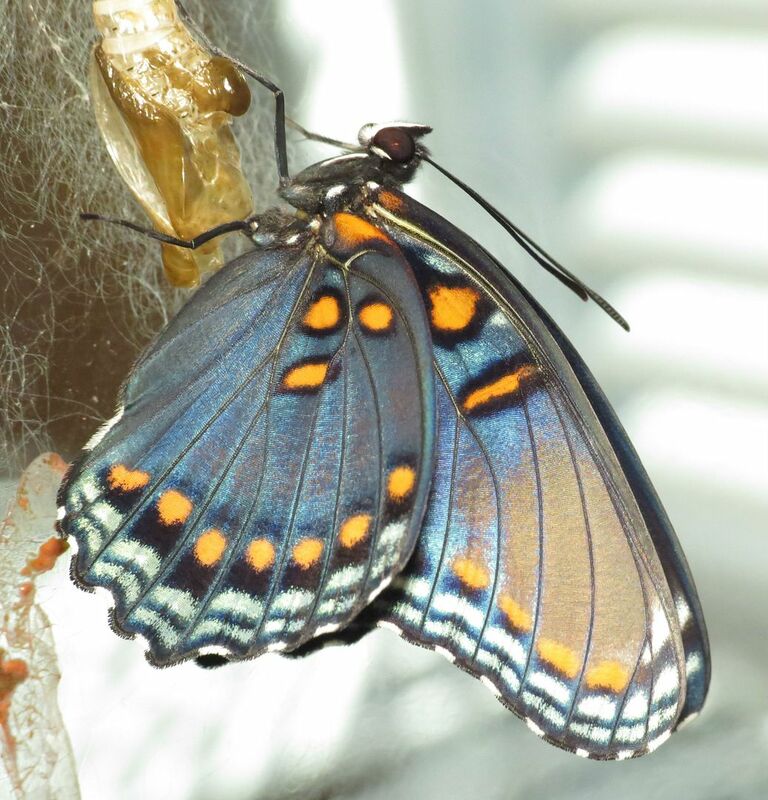 Also happening with Caterpillars this autumn, I'm attempting to raise a Red Spotted Purple or two. 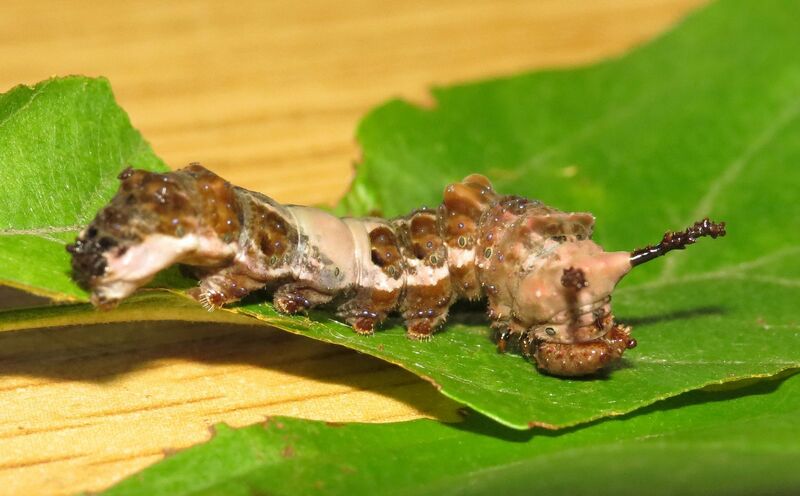 I eyed a female out in the yard laying eggs, curiously on two nonnatives, which the caterpillars seem to be eating. A Snowdrift Crab Apple but they're in the genus Malus so I'm doubt native or not really matters in that case. The other was a Japanese Weeping Cherry, but that's also a Prunus so maybe that doesn't matter as much? Still though I don't see Tiger Swallowtails or Silk Moths laying on the tree so I'm sure the native Black Cherry is the superior host plant. 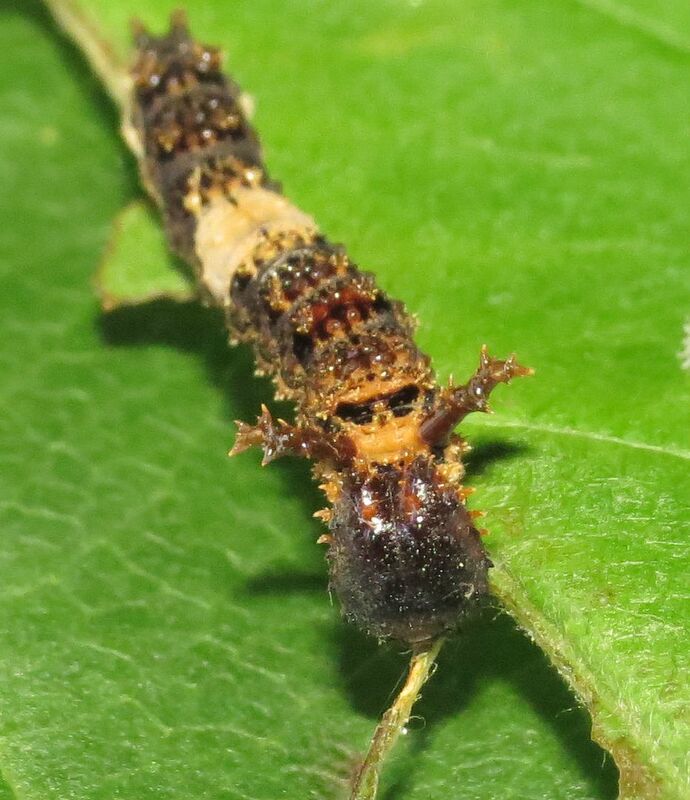 In the short amount of time I've had the sapling Black Cherry I can say I've already found way more caterpillars on it than the ornamental Weeping Cherry. In the wild Red Spotted Purples always lay eggs towards the tip or ends of leaves. Ideally it's the tip but I've seen some of the more spiky edged host plants confuse them when laying and eggs are off center to the side. 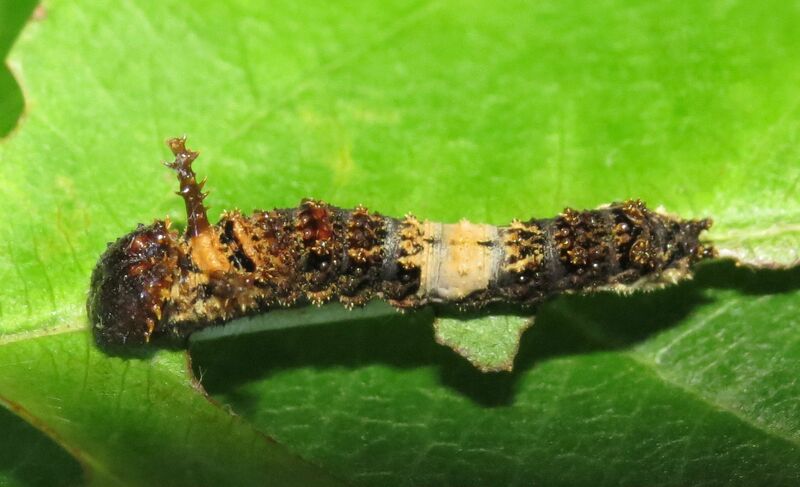 Upon hatching, what seems like 7 days later, the caterpillar begins constructing a "stick" or poll out of its own frass and silk which it hangs out on so ants don't eat them. Funny enough EcoBeneficial interviewed Doug Tallamy about this topic. 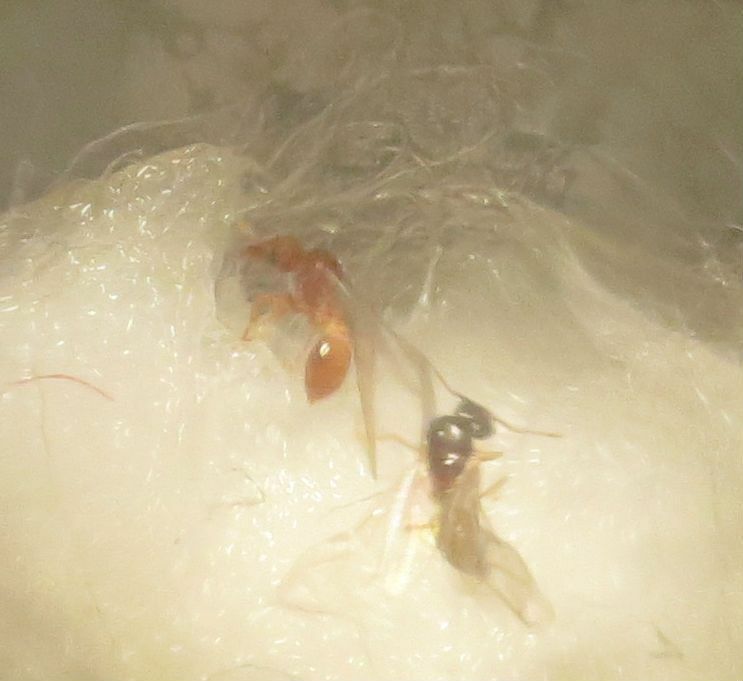 I have the same Lepidoptera species laying eggs on my Black Cherry sapling, but because I have a happy colony of Camponotus subbarbatus living in a log to that flower bed, my tree still has all its leaves! 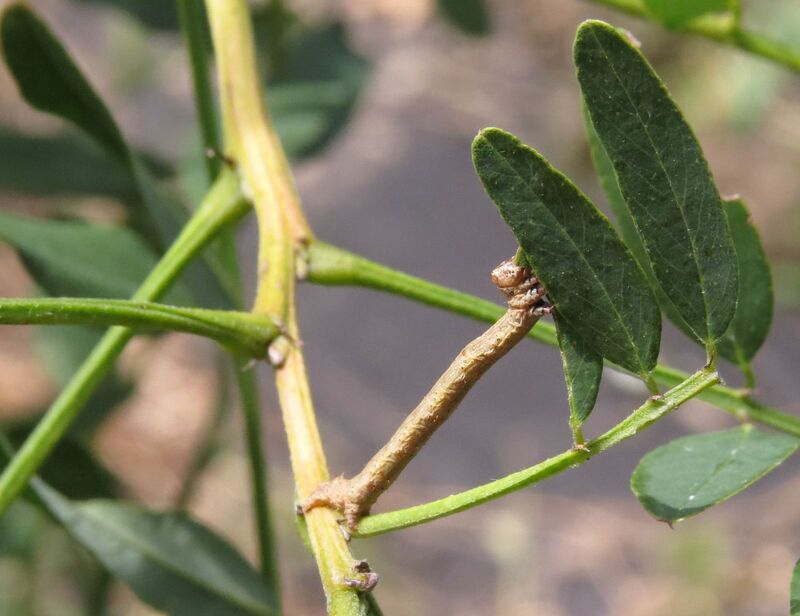 Every leaf on this plant has a nibble taken out which I would characterize as standard first instar caterpillar bites. But nothing beyond that! No branches stripped, no missing leaves, no half munched bites taken out of the leaves. 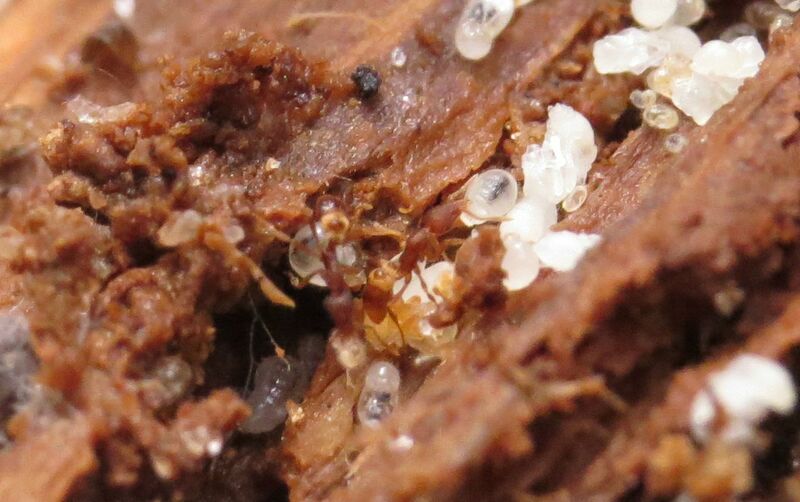 Because I have this ant colony foraging on the tree, the caterpillars never make it beyond the first or second instar. 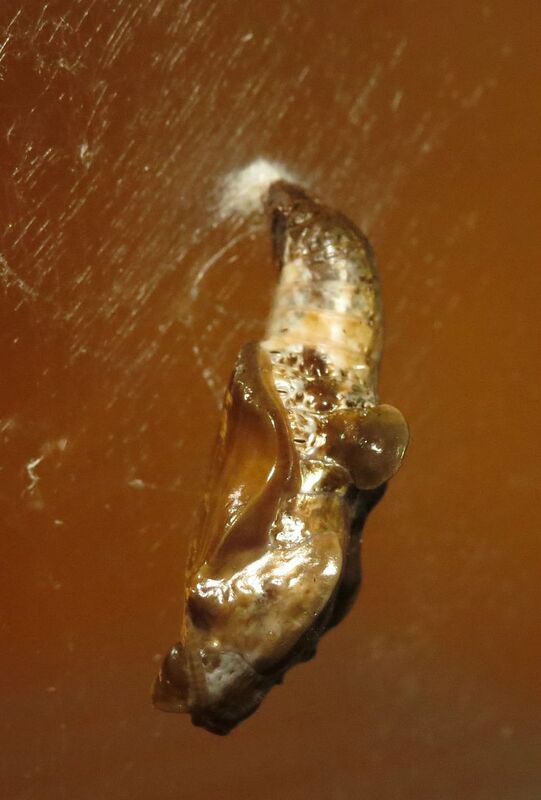 Even the Red Spotted Purples don't seem to live long enough to make their first poo stick. 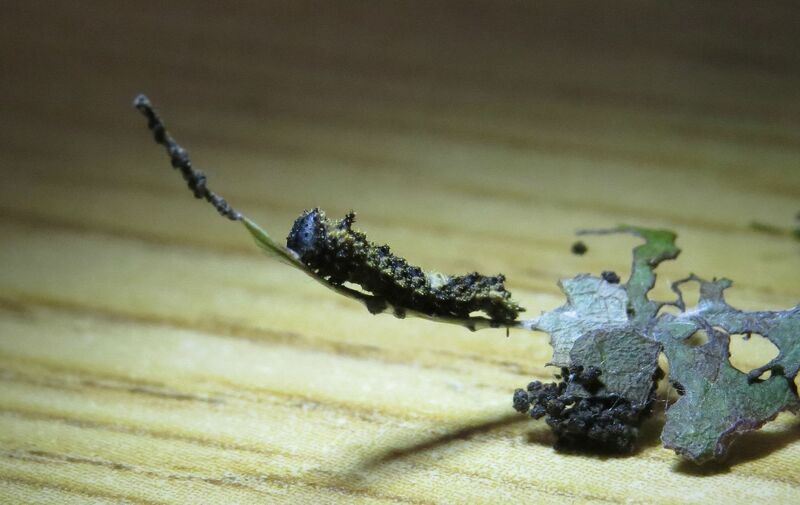 After making the poo stick, they're free to feed on the leaf little by little and always have something to run back to. So a friend suggested to me to keep them in the fridge when all the leaves fall of the tree. Hopefully that will be enough get them to survive the winter and I can continue to photograph their life cycle next spring. 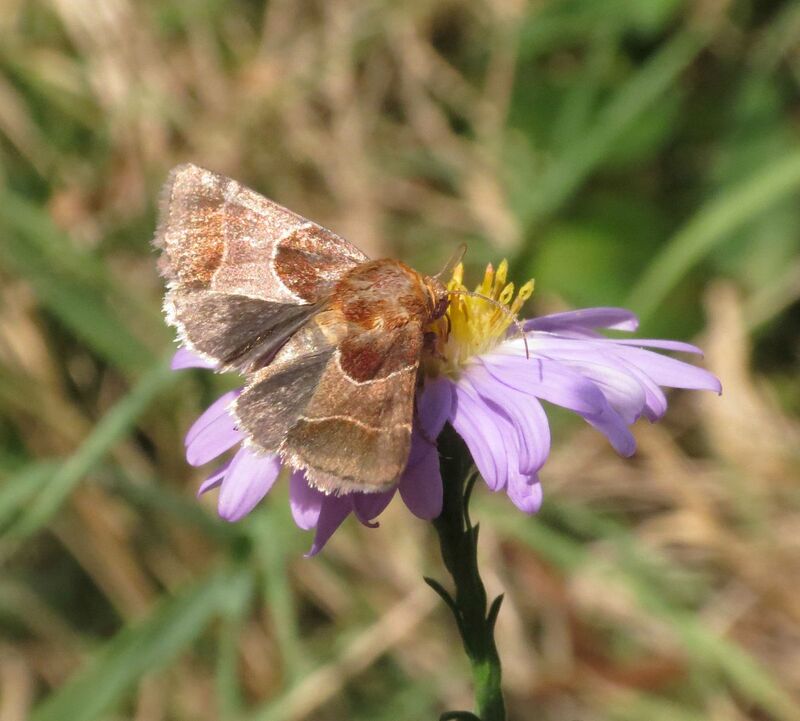 Also out in the garden I found an Arcigera Flower Moth, Schinia arcigera, which is a daytime flying moth that lays its eggs in the flowers to members of the Aster family. 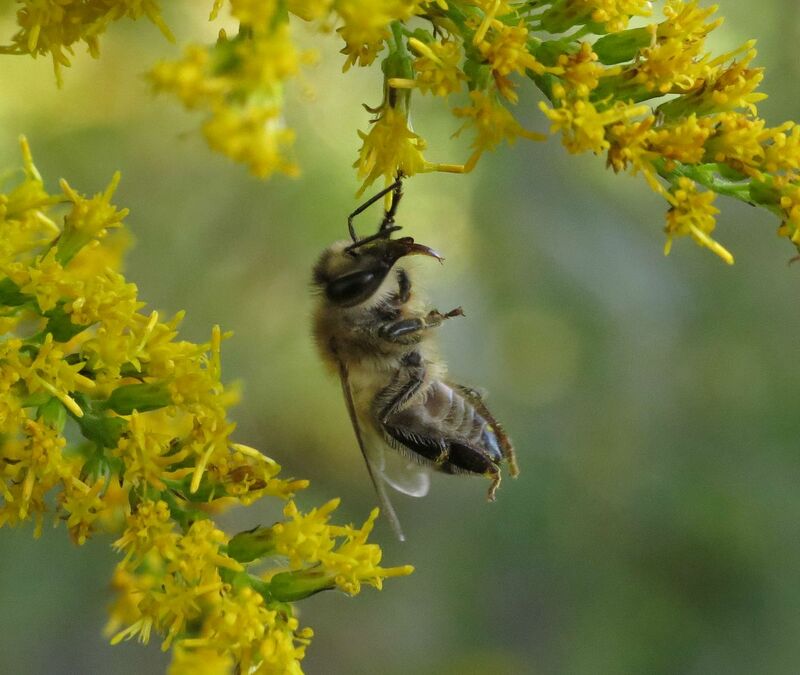 They nectar on open flowers but lay the eggs into the buds that have not opened. 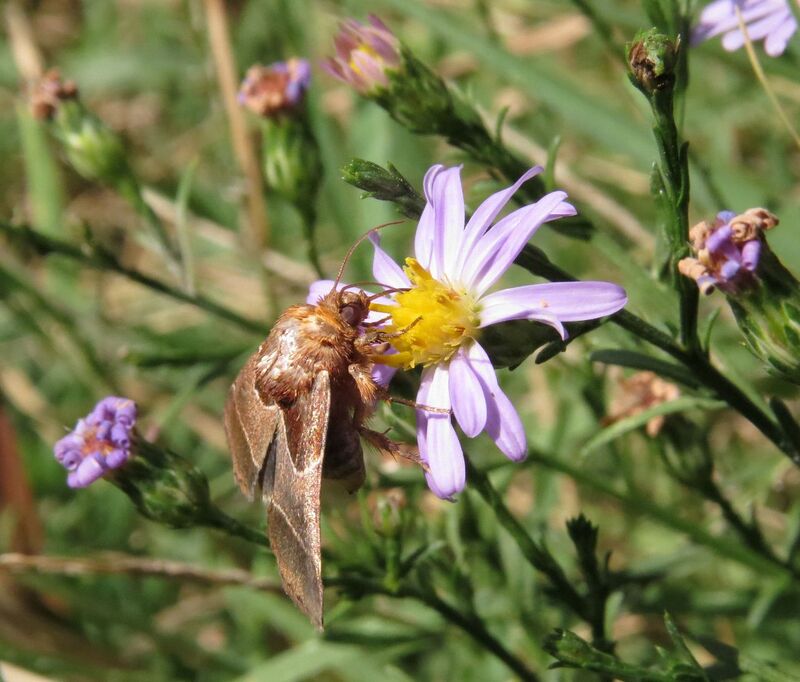 It was a little hypnotic just watching this one hover about the asters. 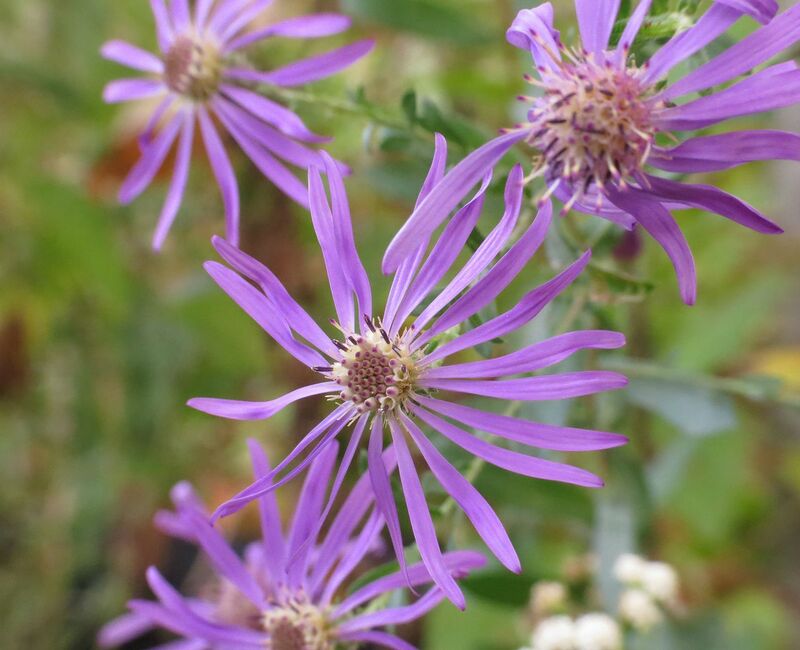 She took a liking to the Aster 'October Sky' which has become my favorite cultivar I think. 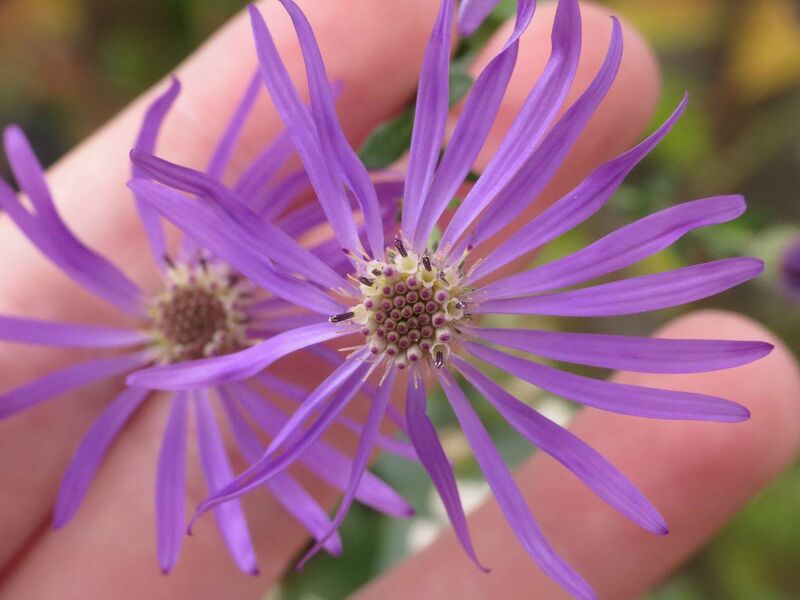 I should really find another Aster cultivar that has a slightly different color to it so I can mix and match. 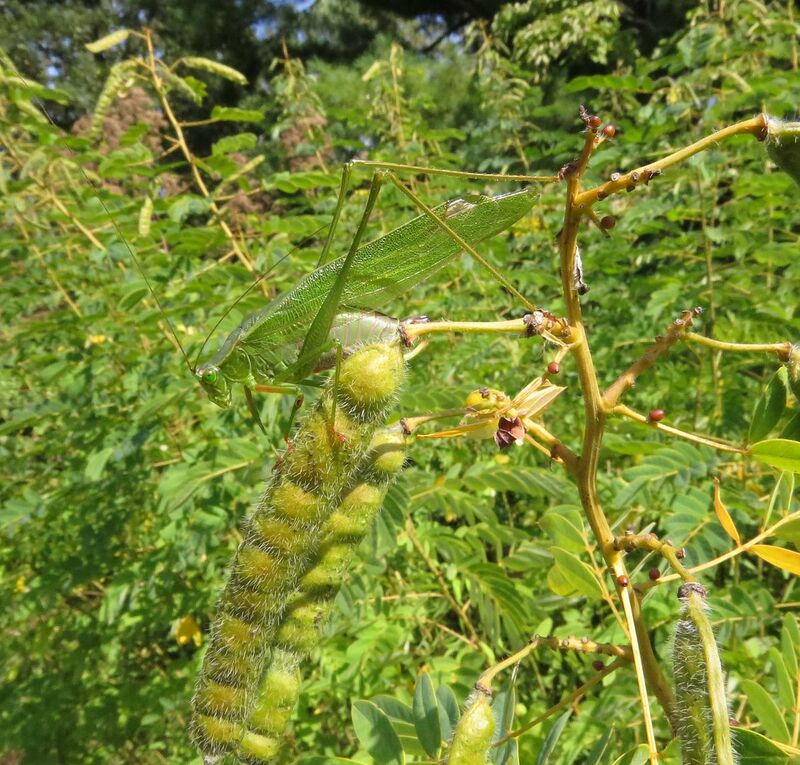 Also saw this one on the False Indigo Bush. I had to prune off the bulk of the foliage to this plant because it was top heavy and going to tip over. It's already sent up a new stem that's just as tall as the old growth was. 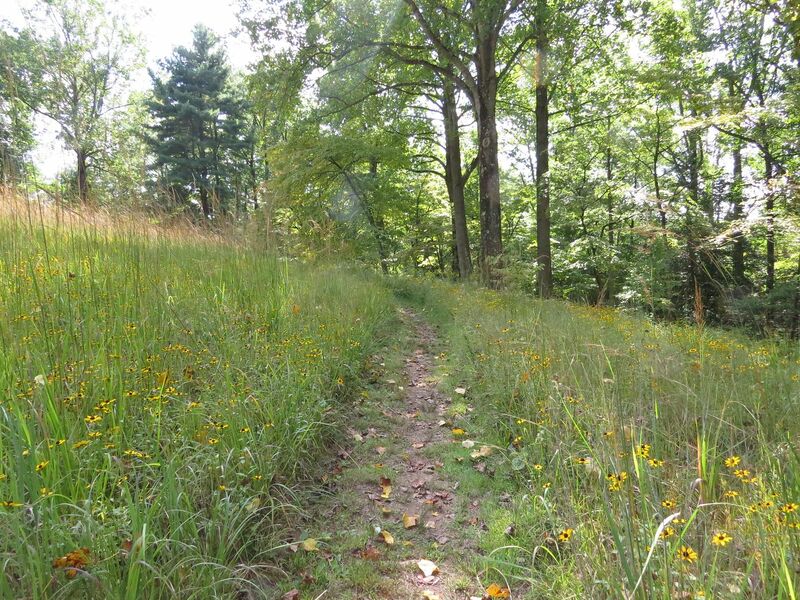 A friend who operates the Shaw Nature Preserve in Missouri says he cuts them to the ground each year after flowering. In nature he tells me it's common for them to become top heavy and fall over, often snapping the stem/trunk completely. It seems evolutionary this species is stuck between being a soft wooded tree and a herbaceous perennial. 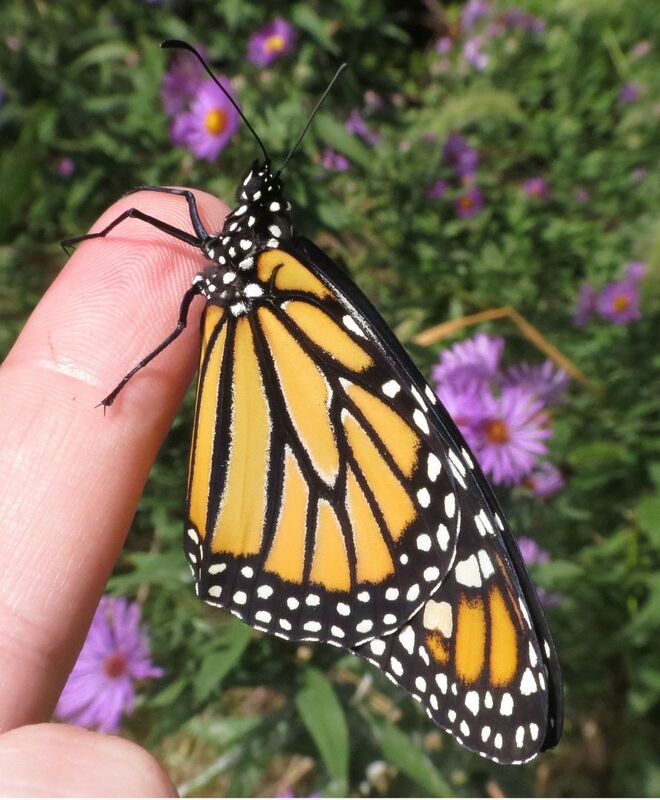 Despite the lack of Monarchs visiting my yard this year I did manage to raise one. Actually it was two but more on that later. 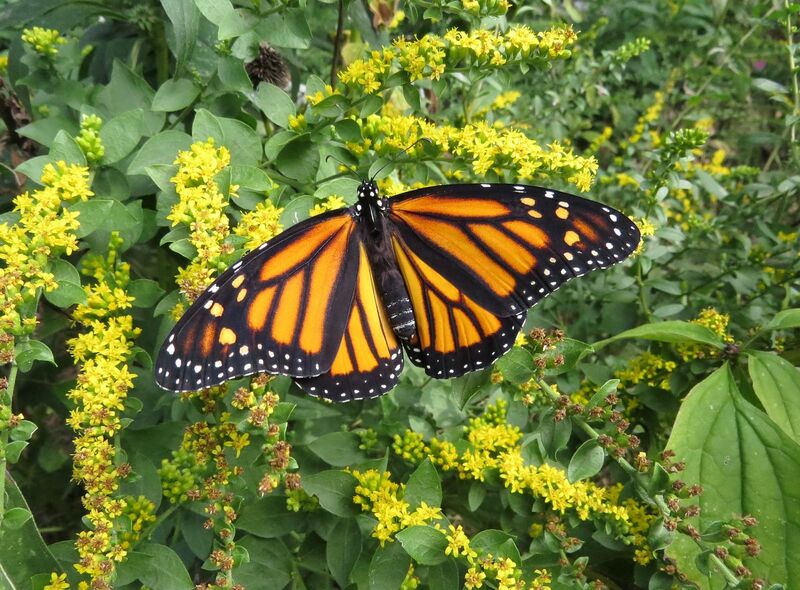 Where I am in New Jersey, we typically don't see Monarchs until August when they're already on their way south. I find them in meadows and natural lands but rarely see them in May or June when Monarch Watch lists sightings of them here. Really the Milkweed here doesn't even emerge from the soil until early May anyhow, but even then August is a more standard time to see them in the yard. I believe this is because they either follow the Delaware river up, or cross it and hug the coast of NJ. 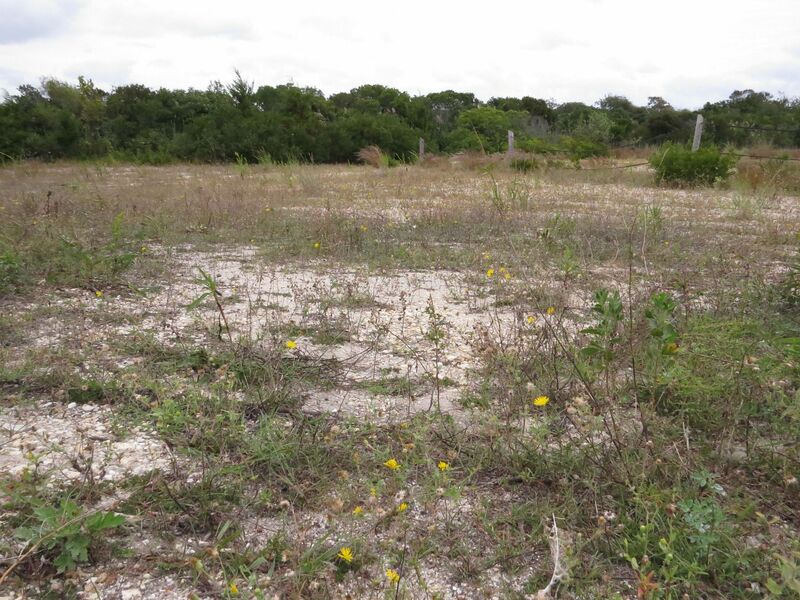 Then as they populate over the summer they move more inland finding different fields and gardens with milkweed to lay eggs and start up populations. Milkweed this year seemed to be sold out from all the local nurseries until mid July. 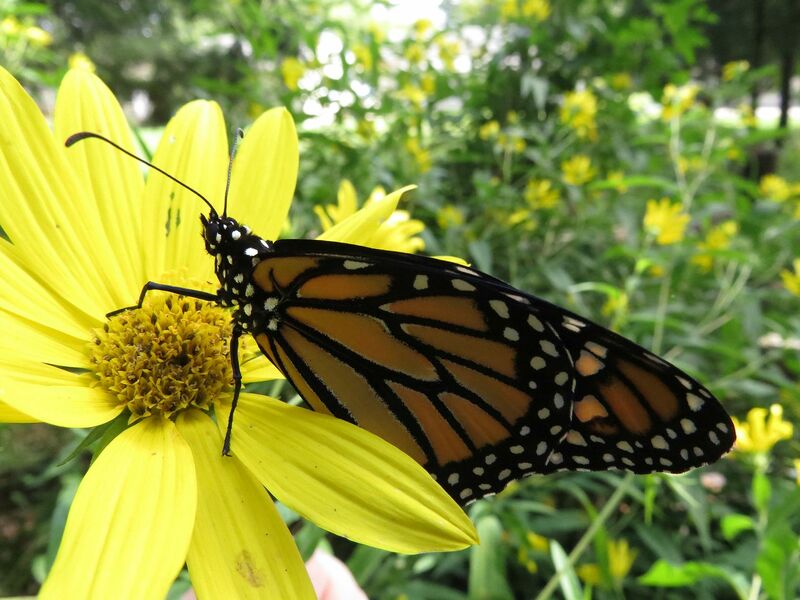 I finally got my hands on a few plants around that time and sure enough the nursery was having issues with Monarchs laying eggs on their supply. They kept having to relocate the caterpillars onto a patch of common milkweed around the back. Naturally I was willing to help by buying the plants that had caterpillars on them already. I moved the cats to the more established plants I already had growing in my garden and one of them became large enough to house in a cage. 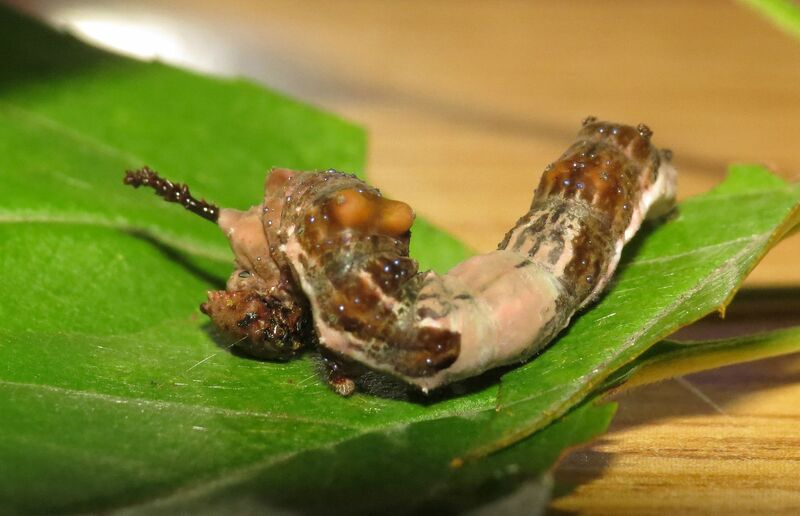 I usually let them feed outside until they're in their last instar. Then I move them into closed containers with milkweed leaves inside. I would have raised more but wildlife got the three or four others over night. The first emerged earlier last week. They're easy to pose at that stage. They don't seem to feed at all until several hours have passed, usually after their first flight. To fly after emerging they require about an hour of sun bathing. I took the opportunity to place her on a few different plants for pictures. These are all plants I know they enjoy nectarine on such as Goldenrod, Asters and Sunflowers. She didn't bother feeding from any of them. 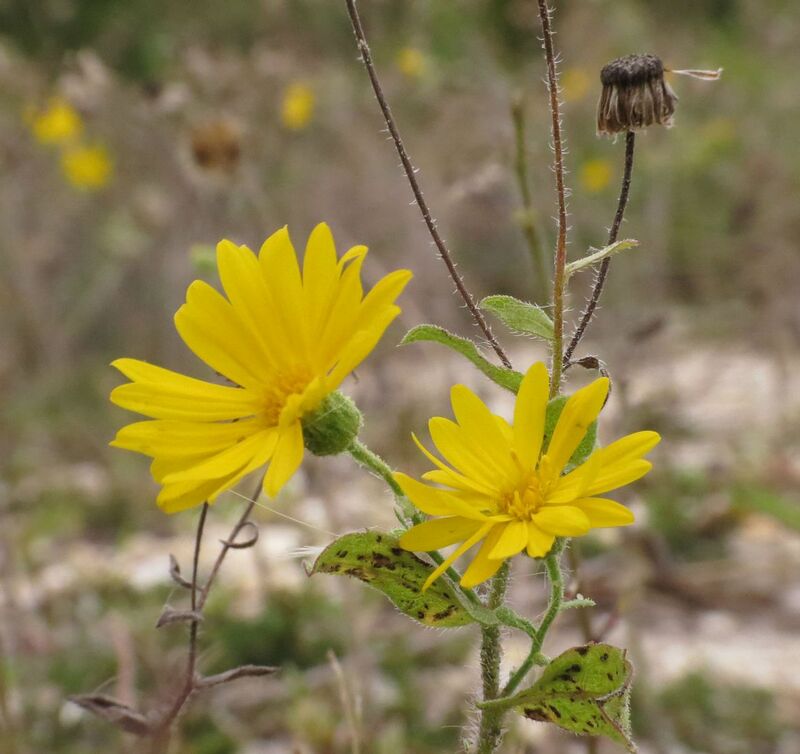 There is a preference for Mexican Sunflowers but the Maximilian would have to do. I would added to this a few pictures of the second Monarch I raised, but I ended up giving it to my sister-in-law. Her father is terminally ill and I remembered the time I first saw a Monarch emerge from its chrysalis, how it brought me to tears watching something so beautiful come to life and fly away. I wanted her to experience that kind of joy because I felt she needed it. The chrysalis came from an Aster 'October Sky' I bought from a nursery in Delaware. I was at the register buying the plant when I said "Holy crap, this one comes with a Monarch!" eyeing the chrysalis hanging off a plant stem. The nursery grows milkweed but I didn't notice any Monarchs on them and the plants were well away from the milkweed table, so this was a welcome surprise. A few days ago this was the picture she sent me. It took off just moments later I'm told and she was grateful that she got to see it. I drove down to Cape May yesterday. This is only an hour and a half from where I live in New Jersey. 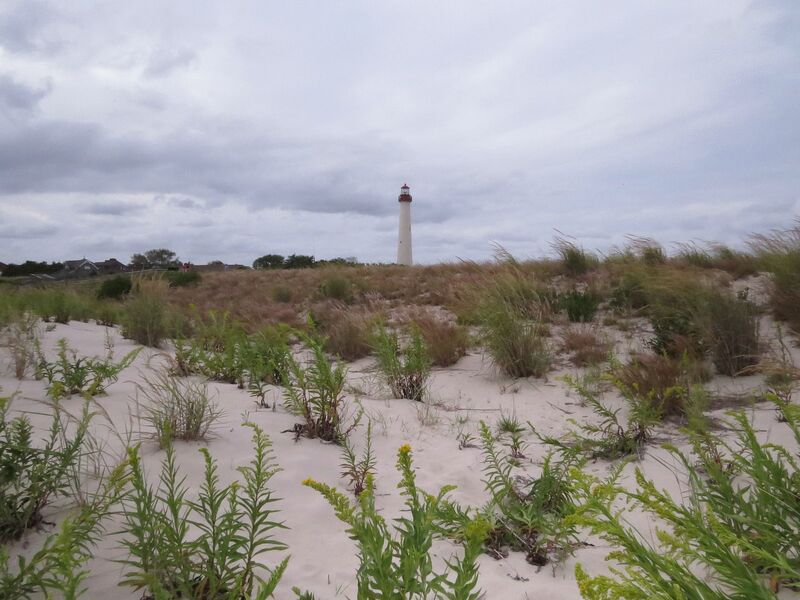 On one side of the dunes is a sprawling bird sanctuary, ponds, and platforms and docks which bird watchers can use to photograph the various sorts of birds that migrate through. 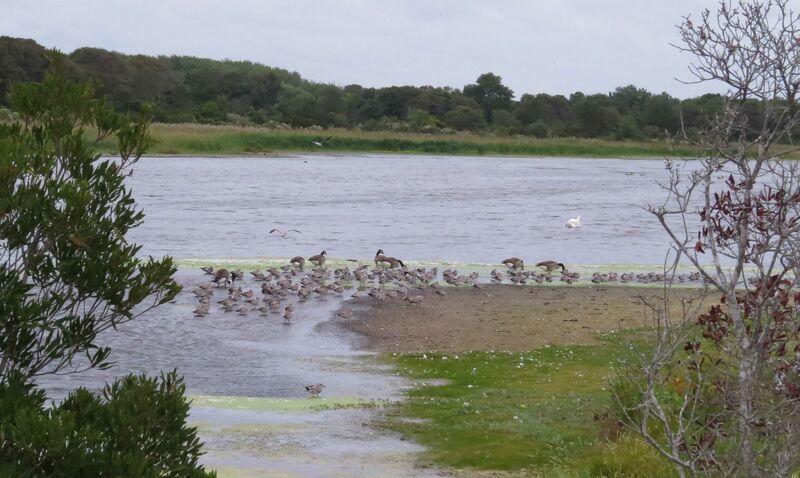 It's something of a birding hot spot in the country. I passed more than one tour in progress with lecturers discussing the different sorts of swans and herrings they were looking at. 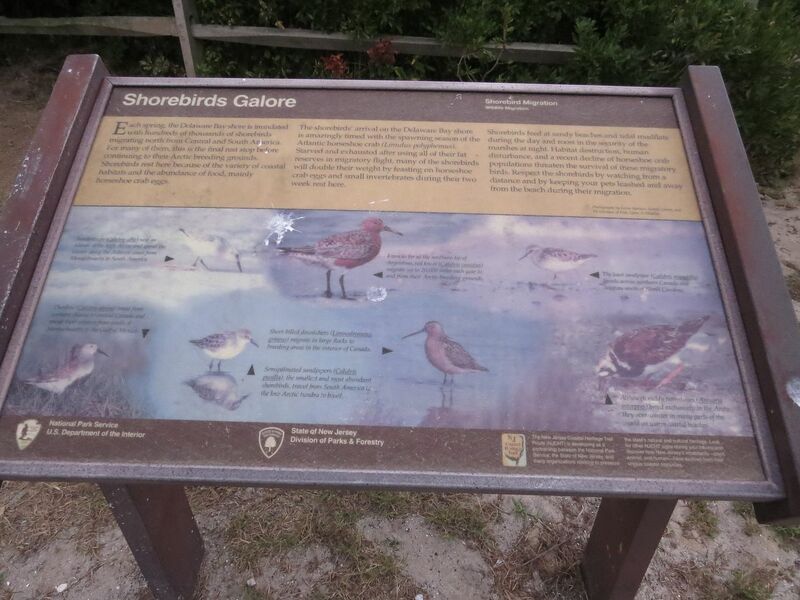 There's an informative sign that talks about the more exotic birds on the list, which the birds had shat on, along with my car. I'm sure I got a picture of something exciting here, but birds really aren't my thing. 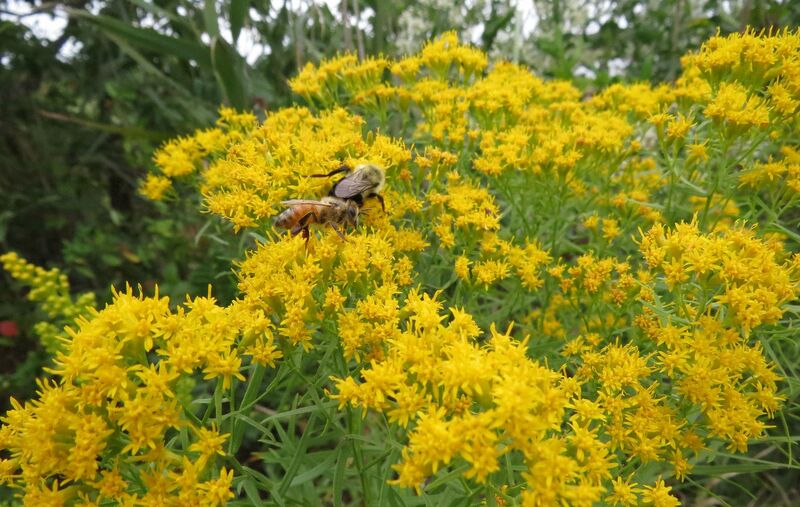 Just on the other side of the dunes there is a sandy beach with droves of seaside goldenrod planted for the Monarch migration. That's the reason I went down there but the day proved too cold and windy for butterflies to fly. The day wasn't a total bust, as I found a few ants to photograph. 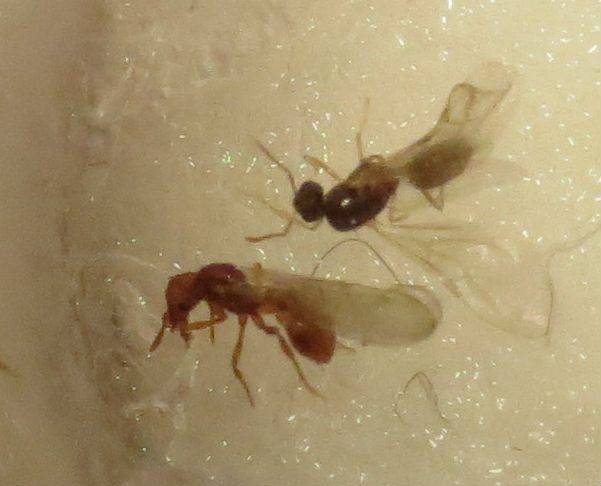 This is the common Lasius neoniger, or Labor Day Ant, who's nuptial flights typically happen around Labor Day and in the afternoon no less, sometimes ruining BBQ's and the sport of golf across the US. 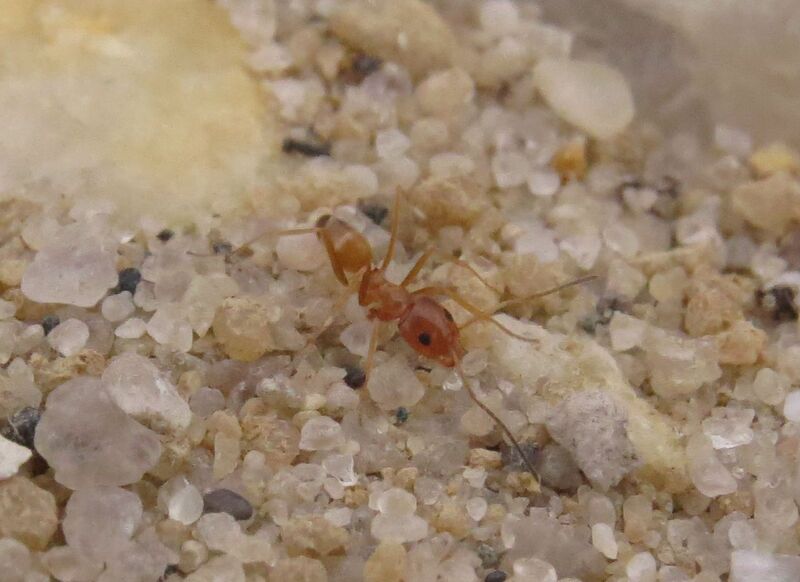 They're otherwise a rather plane and common sort of ant that make small mounds wherever the soil tends to have some amount of sand to it and in full sun locations. 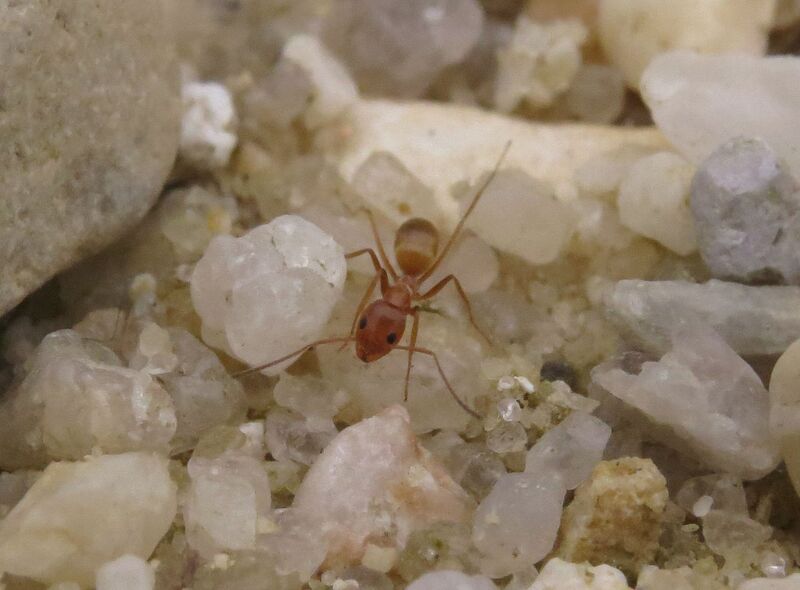 Also found, and slightly more interesting, was the population of Dorymyrmex bureni. 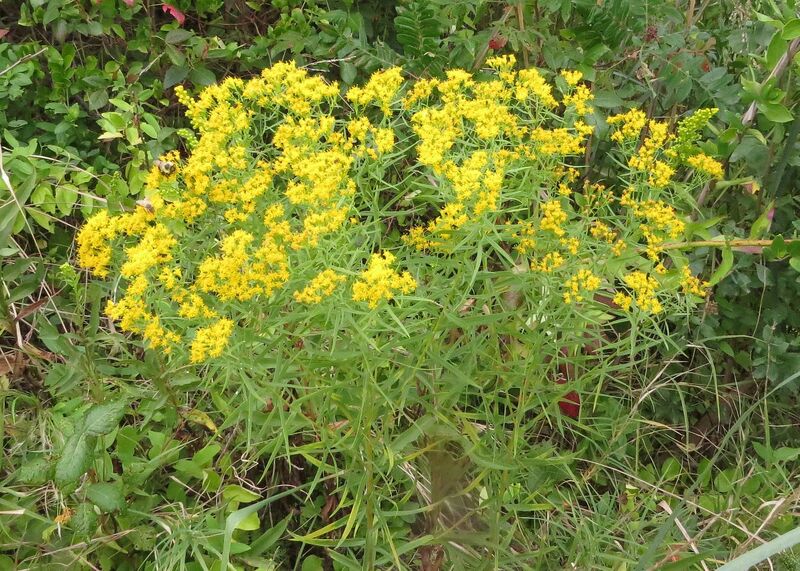 This is a species at home to the state of Florida and South Carolina, but in recent years, it's worked its way up the coast and can now be found in New Jersey! I believe it was first noticed by someone back in 2011 according to Bug Guide. Curiously the Citizen Science website School of Ants doesn't have a dot there yet, though I may have to fix that. 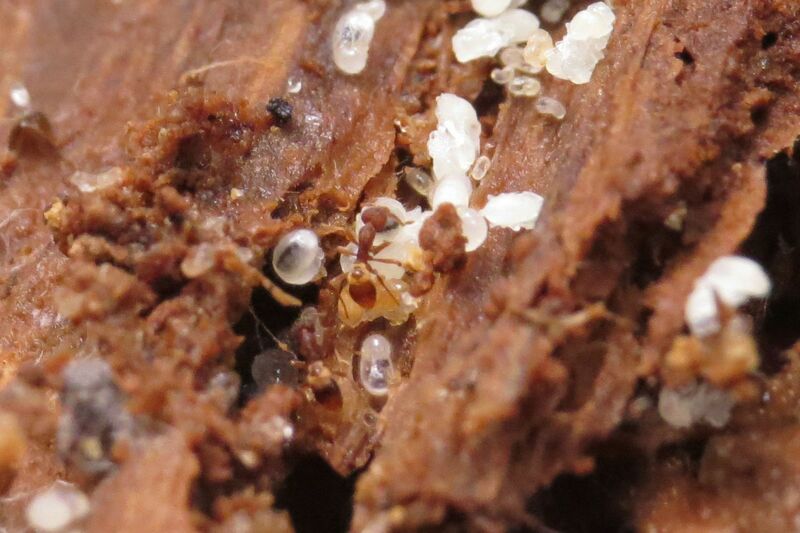 Now that it's 2015 I can say the population there seems to be thriving as I found dozens of nests which outnumbered the indigenous Lasius neoniger. 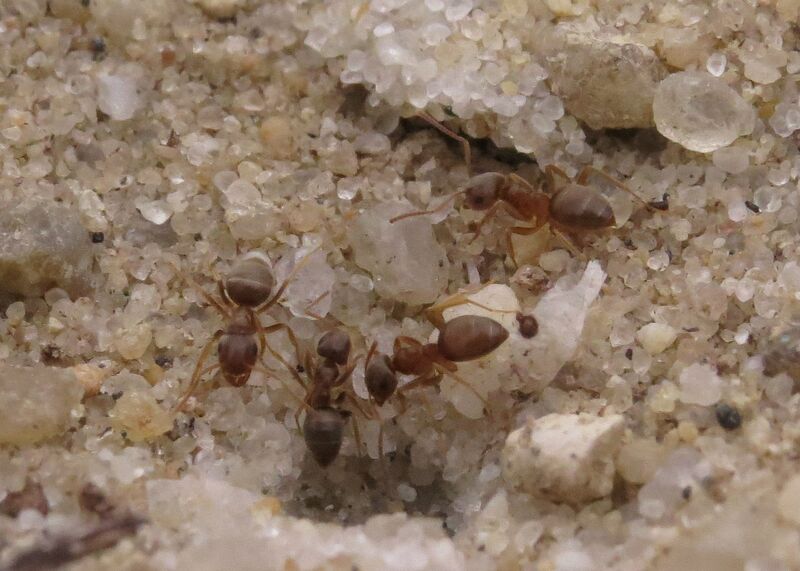 In past years though I've never known the beach line of Cape May to be abundant with ant colonies so this probably isn't an issue to worry about. Simply climate change allowing a species to push its range north. 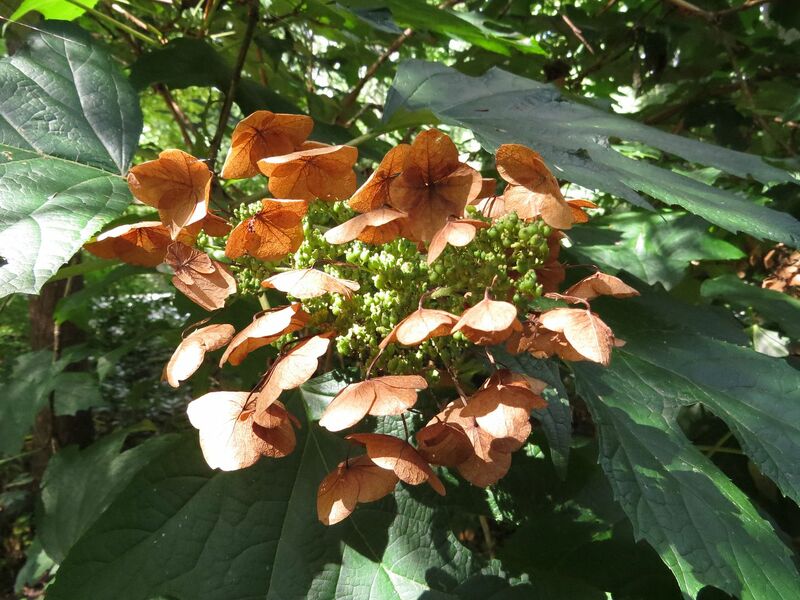 With the majority of summer blooming flowers going to seed or fruit, there's now a new cast of flowering plants coming into bloom. 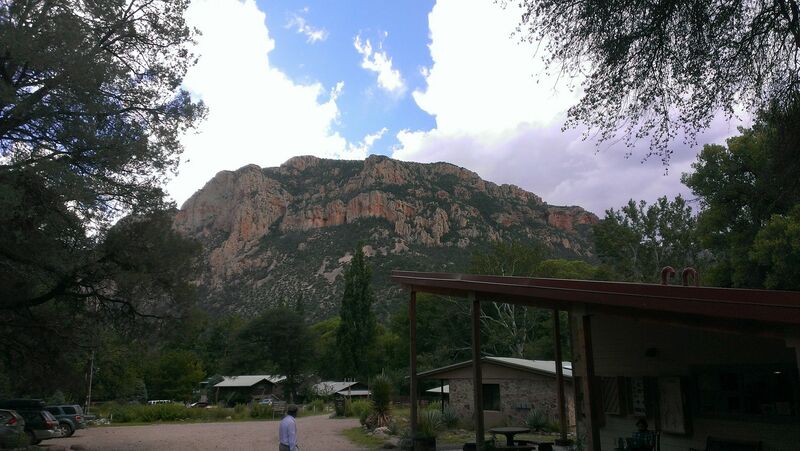 And the Mt. Cuba Center is nothing if not inspiring to see what's flowering and when. I strain to think of species they don't have growing somewhere on their property; Campanula americana comes to mind but really few others. In fact I'd say going there has broadened my knowlage of plant species. 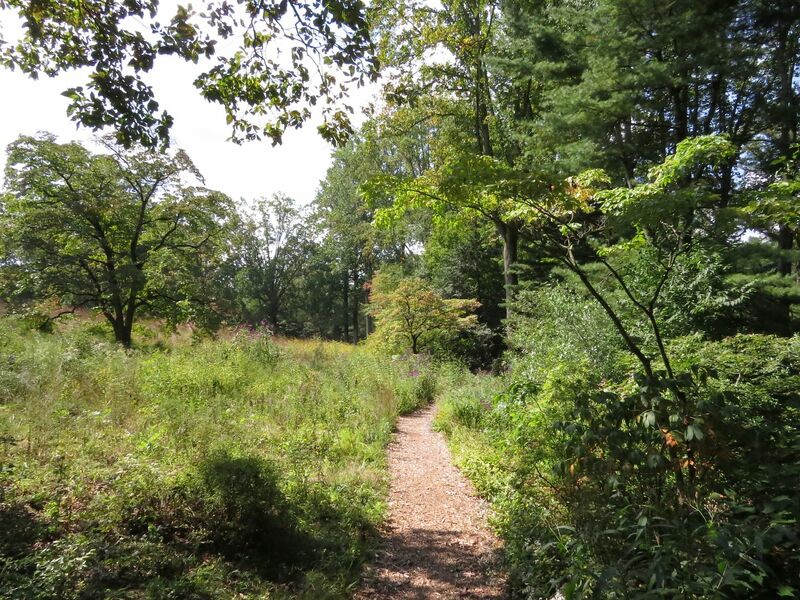 At times it feels as though I'm walking through Donald Leopold's "Native Plants of the Northeast" which few other gardens can do. I've been to Longwood Gardens several times and they should really change their name to Long Lawn Gardens. They have long pathways that go on quite a ways with flowers lining the side, but the trouble is it's the same 5 to 10 species or cultivars repeated over and over again, making it about as exciting as watching a copy machine pump out page after page. Their green house has an impressive collection of plants but are setup like museum dioramas without the fake cave men and stuffed animals. Their meadow is the only real highlight I'd say worth going to because of the wildlife factor which at times even out shines the Mt. Cuba Center. At the Mt. Cuba Center meadow there's still plenty of wildlife flying around but mostly in bug form. The natural approach looks better, though I know lots of people won't like this. I just love the sweeping effect of color and the movement of the grass as the wind blows over the field. They do have sections where they specifically put in a plant so when they do tours they can show it front and center. 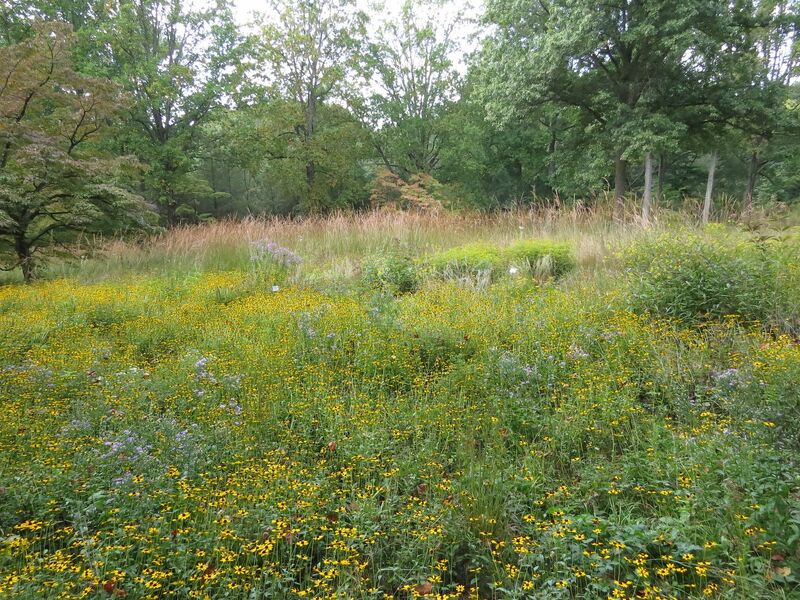 The late Mrs. Copeland strongly believed that a meadow should primarily be made up of grasses. I do see the beauty in that, but frankly I find such meadows to be boring. Grasses are almost exclusively wind pollinated so you don't get the bees and butterflies that you get when incorporating wildflowers. At the top of the meadow is the wildflower bed, which you can't see from the bottom. Beyond that line of tall grasses is a hill that gradually slopes down to the ponds where there is a gazebo for sitting. The meadow looks wonderful from that spot, and they try to maintain the primarily grass feel of it down there. Upon closer inspection though it becomes obvious that several wildflowers have crept down the hill. Black-eyed Susan primarily but also a small amount of Butterfly weed. Both of which I believe were intentional. Pearl Crescents, common in some gardens, rare in others. 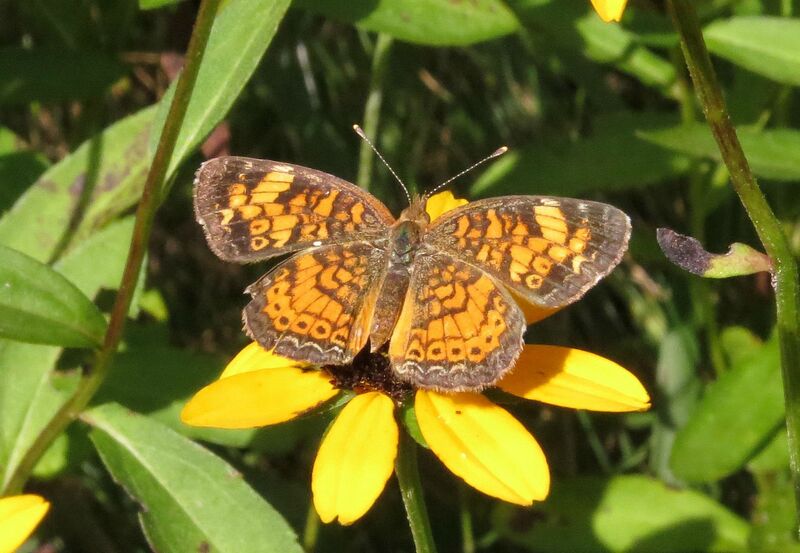 These are one of the few butterflies I find drawn to Black-eyed Susans. 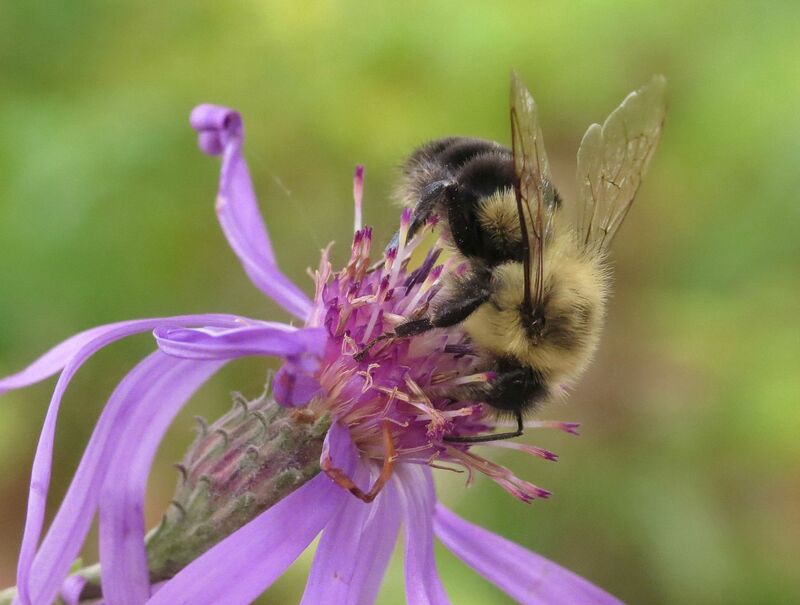 They host on an assortment of Asters. I believe they're in the habit of laying a single egg here and there, thus it takes a lot of Asters scattered around a forest edge to get them to flourish. The Mt. Cuba Center was where I first learned what a Leather Flower was. 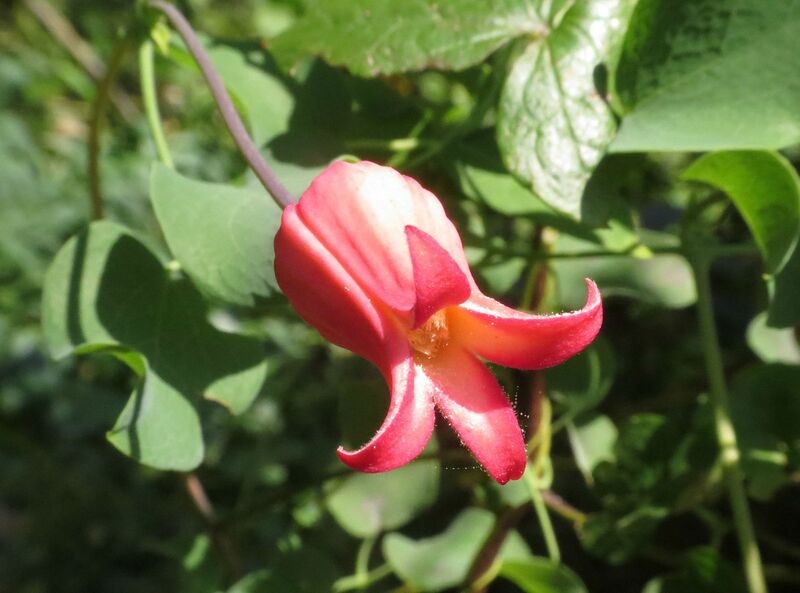 Turns out our native Clematis are rather pretty-looking. They're almost like a fat honeysuckle, and they're good about growing through other plants. Unlike a lot of vines, I believe they die back to the ground each year. 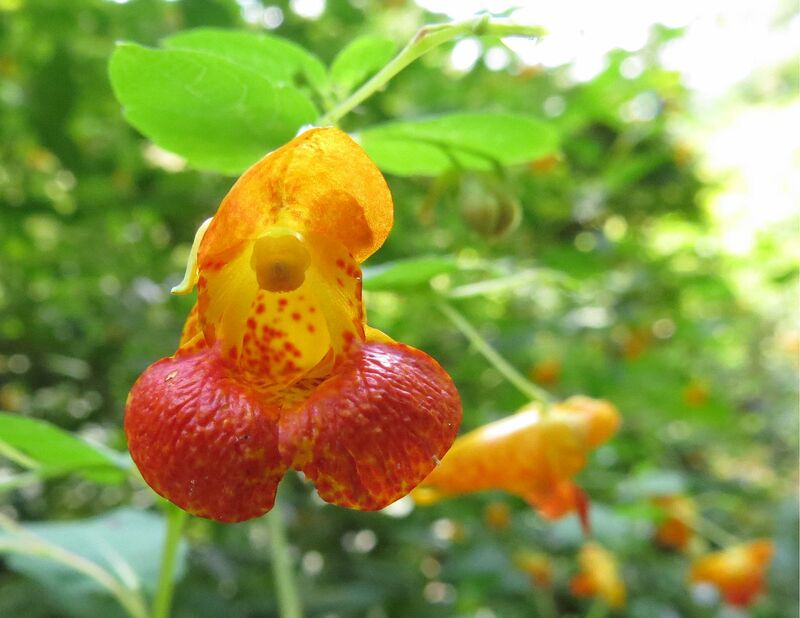 Jewelweed grows like a weed all along the roadsides of that part of Delaware. They include a few plants in their gardens, but I'm sure they also must weed a fair amount of it out. 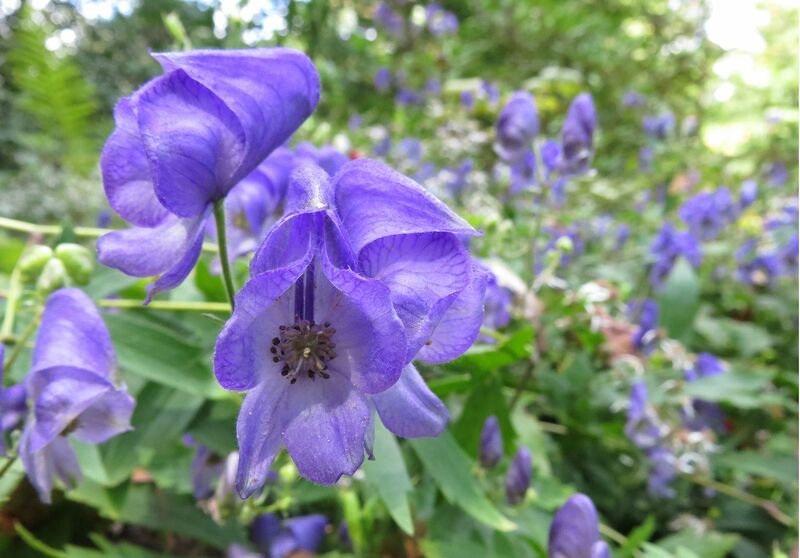 They make Southern Blue Monkshood look so easy to grow. Aconitum uncinatum, is another vine that dies back to the ground. 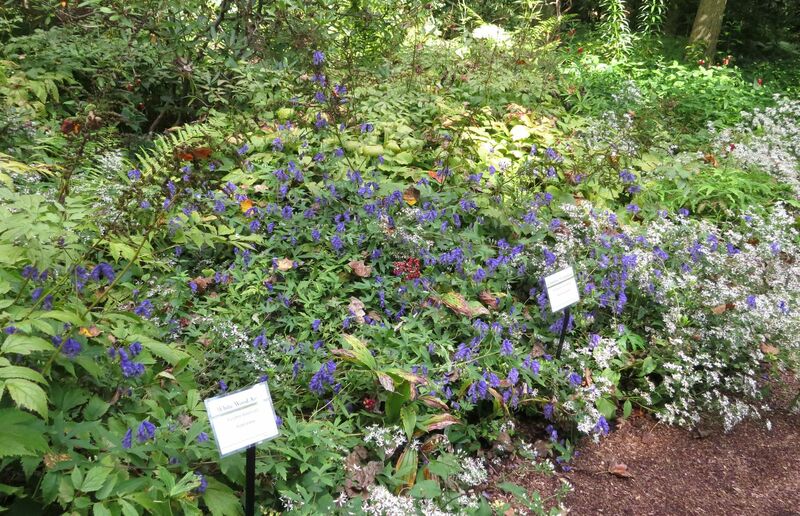 They have it growing in patches and individual specimens, each time though the foliage is usually hidden with whatever plant they're growing up, through, or laying on. It's only after the plant flowers that anyone really bothers to notice it. 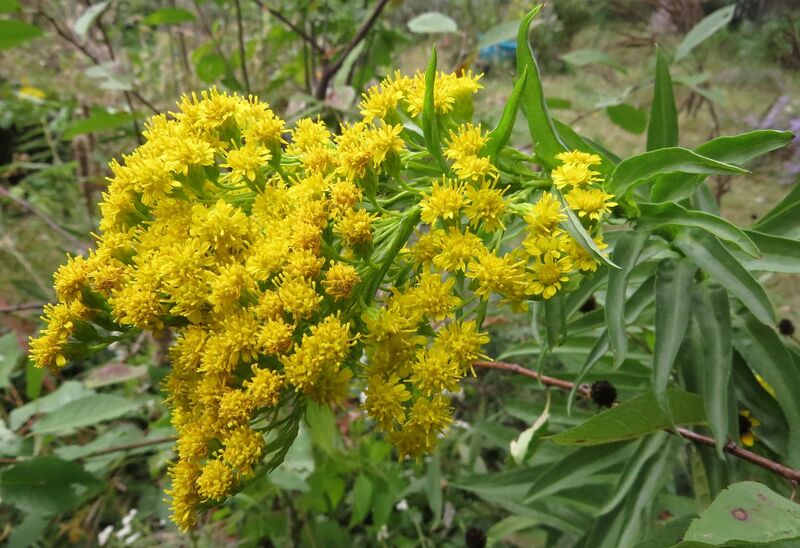 The plant I have in my garden is maybe a single stem with a single cluster of flowers at the end of it. Here though, they have plants that send up dozens of stems that spread out and climb up other plants to bloom all over the place. This is also one of those deadly plants native Americans used to poison their arrows with so maybe it's good that it's not growing in big patches in my yard. 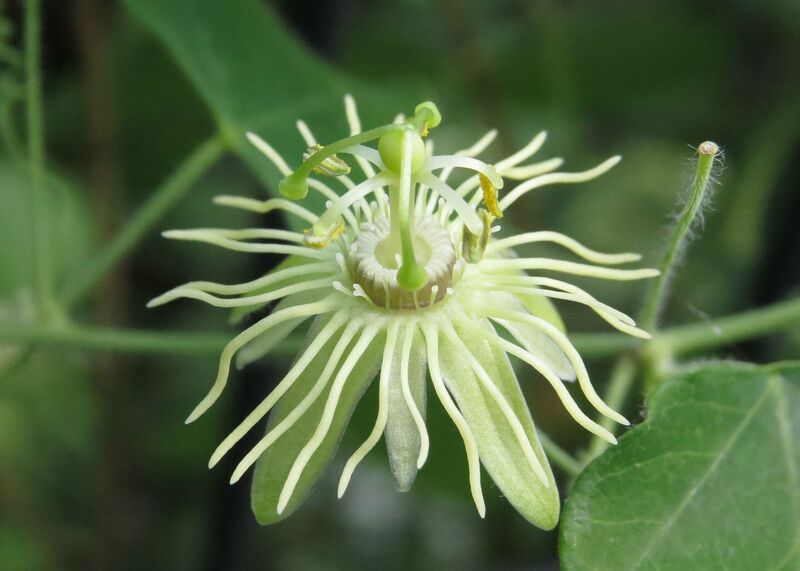 Yellow Passionflower, Passiflora lutea. This plant has the most charming little leaves I've ever seen on a plant, and the flowers are so tiny compared to other passion vines. This could be replacement for English Ivy in some scenarios. I had a Yellow Passion plant in my garden that would come up as a single stem, make a few flowers and die off. The Mt. Cuba Center though has one that's taken over the corner fence of their Trial Garden and is loaded with blooms and berries.